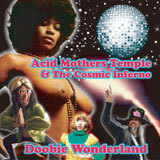 Acid Mothers Temple and its many, many offshoots have being challenging underground psychedelia for some years now. Formed in 1995 by inimitable frontman Kawabata Makoto (who has being tripping off this type of music since the 70s) Acid Mothers Temple have released consistently brilliant trips into the weird and unknown which have gained them a respected reputation amongst a varied audience from psych enthusiasts to prog collectors. Their latest album ‘Doobie Wonderland’ finds Makoto under his most famous moniker expanding on his now instantly recognisable brand of progressive rock. Five tracks of winding experimentation make up the opus along with easily the most standout cover art of the year. Opener ‘Do You Remember Doobie Wonderland?’ sets the tone for this opus clearly with 20 minutes of bizarre and intriguing astral riffing. The insane and otherworldly vibe of this song should be a fair warning to people who like their music in a steady pattern with the song constantly pulling in different directions to make for a pleasantly confusing experience. The open experimentation is what makes this band so unique and ‘Doobie Wonderland’ is the real deal when it comes to rebellious music. Songs like ‘M.J.Love 666’ seem genuinely boundary-less and a mounting expectation grows through this opus as it goes further and further into the obscure. Although a very individual project, Acid Mothers Temple’s influences are still evident at times on ‘Doobie Wonderland.’ The recurring use of Hawkwind like space rock noises is a clear nod as to where they got some of their oddball attitude and early bands like Deep Purple and Pink Floyd would also seem to have left a lasting impression. These influences have then been transformed into something even more psychedelic and pushed into weird new territories. This is most evident in the strangely catchy ‘Planet Golden Love’ which utilises an infectious riff at its core and takes it into more unchartered sounds within rock. Album highlight ‘Dance Space Gypsy Queen’ (surely an old b-movie title) is where all Acid Mothers Temple’s different elements come together with the most explosive results. Floaty guitars and otherworldly noises make up the track which, like all their songs, appears to be more of a very successful jam then a thought out, pre-constructed song. Very little drawbacks can be found to ‘Doobie Wonderland’ except perhaps the album requires the listener’s patience. As most of the songs are quite long and not particularly heavy, it’s unlikely that fans of typical doom are going to find as much to work with as people who like Camel and Jethro Tull. Acid Mothers Temple has entered another level of musical dementia with ‘Doobie Wonderland’ which provides something completely different to what most bands are doing out there. If you switch off the sound on sci-fi classic ‘Forbidden Planet’ and put this wax on as a soundtrack you’ve got yourself a perfect evening to venture the cosmos which is reason alone to pick this up.